Proprietor Eric Hall is someone with a passion for Pinot Noir. So much so that he followed two decades of high tech success in San Francisco by fleeing the city, cashing in his dot com earnings and bought a spread in Cazadero in the semi-remote West Sonoma County. He quickly became immersed in the wines of the Russian River Valley region, later moving from Cazadero and buying a small resort property in Guerneville. Eric gained valuable winemaking experience at the Papapietro Perry Winery and co-founded the Pinot on the River Festival in 2004. 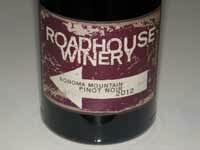 He teamed with friends and family and created Roadhouse Winery in 2010 in downtown Healdsburg. 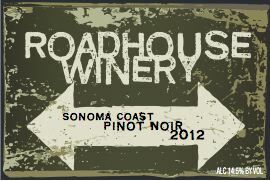 Roadhouse Winery makes Yorkville Highlands, Russian River Valley and Sonoma Coast Pinot Noirs in a California style, from name vineyards like Weir, Nunes, Sangiacomo, Leras and Silver Pines. Production is just over 2,000 cases annually. The wines are sold online with discounts to wine club members. The winery's tasting room is located in downtown Healdsburg at 240 Center Street just a few doors down from Oakville Grocery.